The HUBER Membrane Screen is a very fine screen with a low headloss and provides a large screening surface due to its drum-shaped screen basket and 35° installation angle. The screen uses a square mesh that provides, contrary to conventional slot screens, a defined separation size and therefore ensures reliable separation of solids. The HUBER Membrane Screen ROTAMAT® RoMem is suitable for municipal and industrial wastewater flows of up to 3500 m³/h and can be equipped with a square mesh size from 0.5 to 1.0 mm. Optional "PRO"-Series: The special design of the RoMem PRO series isolates the water level in the trough from the water levels upstream and downstream of the screen. 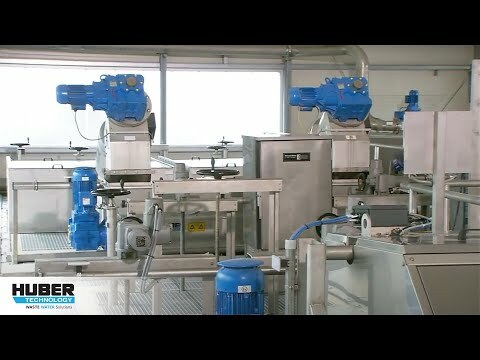 This operation method permits continuous screen operation with a constant water level upstream of the machine and significantly increases throughput capacity. Fine mesh screens are able to remove high loads of filterable solids, COD and BOD and thus relieve the load on downstream treatment systems. Their space requirements and investment costs are only a fraction of what would have to be invested for a preliminary treatment system.